The Temple Mount in Jerusalem has been an area of major global and religious conflict over the last 2,500 years. Many wars have been fought to seize control of this religious site. What does Bible prophecy say about this epicenter of global conflict? Jerusalem’s Temple Mount has an ancient biblical history, going back as far as 1800 B.C. when Abraham, being tested by God, came to Mount Moriah to offer his son Isaac (Genesis 22:2, 12). The site came to be known as the “Mount of the LORD” (verse 14). Four hundred years later Moses referred to this site after leading the Israelites out of Egypt (Exodus 15:17). Four centuries after that, King David purchased this site for the location of a future temple (1 Chronicles 21:18-24; 2 Chronicles 3:1). The first and second temples were erected on this site following Solomon’s construction of the platform with its huge foundational stones that leveled the surface of the rounded hilltop. The first temple, dedicated around 960 B.C., lasted for about 375 years until it was destroyed by the final Babylonian invasion in 586 B.C. (2 Chronicles 36:17-20). All of the sacred articles in the temple were carried off to Babylon to completely destroy this sacred Israelite religious site (2 Chronicles 36:18; Daniel 5:2-4). A remnant of Jewish captives eventually returned to Jerusalem and built a second temple on the same site. More than four centuries later Herod the Great rebuilt and beautified this second temple, and it was to this edifice that Jesus came (John 2:20). Even after the second temple was destroyed by the Romans in A.D. 70, the mount upon which it stood continued to be a vital site in world events. Both temples were at the center of major global conflicts led by the greatest world powers of their times. And even after the second temple was destroyed by the Romans in A.D. 70, the mount upon which it stood continued to be a vital site in world events. After the Jewish revolt in A.D. 135, the Romans ordered that no Jews could enter the city upon penalty of death. They renamed Jerusalem Aelia Capitolina, as it would be known for the next 200 years. By A.D. 661 the Muslims had taken control of Jerusalem and the Temple Mount. In 685 Abd al-Malik became the Muslim commander in Damascus and Jerusalem, and he dreamed of building a mosque, the Dome of the Rock, on the very site of Solomon’s temple. Author Simon Sebag Montefiore described the Muslim commander’s motivation in his book Jerusalem: The Biography, “Abd al-Malik was rebuilding the Jewish Temple for the true revelation of God, Islam. … After it was finished in 691/2, Jerusalem was never the same again” (2011, p. 191). The Temple Mount has remained under the control of various Muslim peoples and states for most of the years since. In 1095 Pope Urban II demanded the conquest of Jerusalem for the Catholic Church. As Montefiore wrote, “Urban saw his life’s mission as the restoration of the power and reputation of the Catholic Church” (p. 218). In the summer of 1099 the first of the Crusades captured Jerusalem and the Temple Mount from the Muslims. The ensuing slaughter of Muslims and Jews in Jerusalem in the name of Christianity was absolutely appalling. People were decapitated and limbs were severed and thrown in the streets. Montefiore wrote that as the crusaders “fought their way towards the Dome … they rode in blood up to their bridles” (p. 222). This is reminiscent of the Bible’s description of the future time when blood will run “up to the horses’ bridles” in the Kidron Valley in Jerusalem at the second coming of Jesus Christ (Joel 3:12-14; Revelation 14:20). Jerusalem and the Temple Mount continued to be the center of conflict between Catholic crusaders and Muslims for the next 200 years. At the beginning of the 14th century a new political power entered as the Muslim Ottoman Turks took control of Jerusalem and the Temple Mount and held it for 450 years until the end of World War I. Their most notable ruler was Suleiman the Magnificent (1520-1566) who made a lasting impact on the Temple Mount. Known by many Muslim scholars as “the second Solomon,” Suleiman rebuilt and sealed up the Golden Gate or the eastern gate of the Temple Mount that faces the Mount of Olives. This gate will most likely remain closed until Christ sets His feet on the Mount of Olives (Zechariah 14:4; Acts 1:9-12). On Nov. 2, 1917, England’s foreign minister, Arthur James Balfour, signed the famous Balfour Declaration mandating a Jewish homeland in Palestine. That idea faced great opposition from the Arabs and the British government over the next 30 years, but on May 14, 1948, David Ben-Gurion, Israel’s first prime minister, declared the establishment of the State of Israel. Israel won the intense war that immediately followed, but the old city of Jerusalem and the Temple Mount remained in the hands of the Hashemite Kingdom of Jordan. 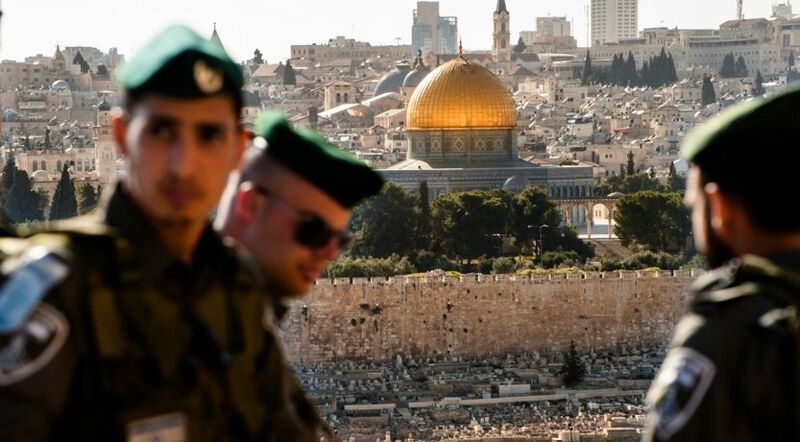 After capturing the old city of Jerusalem and the Temple Mount in the Six-Day War in June 1967, Israel left the administration of the Temple Mount under Muslim control while maintaining its military control. But conflict, controversy and tension continue to boil to this day. Zechariah prophesied about conflict in the “latter days” over Israel and Jerusalem that would include the Temple Mount. “Behold, I will make Jerusalem a cup of drunkenness to all the surrounding peoples, when they lay siege against Judah and Jerusalem. And it shall happen in that day that I will make Jerusalem a very heavy stone for all peoples; all who would heave it away will surely be cut in pieces, though all nations of the earth are gathered against it” (Zechariah 12:2-3). These scriptures pointing to the Jewish state in what the Bible calls the “end times” show Jerusalem with its Temple Mount will be like a “heavy stone for all peoples” because different “peoples” and nations will continually try to wrest control of it. Prior to the Passover in the spring of A.D. 31, Jesus spoke to His disciples from the Mount of Olives about the future of the temple. He predicted that it would be thoroughly destroyed, which did occur almost 40 years later in A.D. 70 (Matthew 24:1-2). In Luke’s account of this prophecy Jesus spoke of Jerusalem being surrounded by armies “that all things which are written [in the prophecies of the Old Testament] may be fulfilled,” and the people will “be led away captive into all nations. And Jerusalem will be trampled by Gentiles until the times of the Gentiles are fulfilled” (Luke 21:22-24). Many Jews were slaughtered in the uprising that ended in the destruction of the temple in A.D. 70, but the survivors were not “led away captive into all nations.” So this statement indicates a massive invasion of Jerusalem lies yet in the future before Christ returns. Jesus said this future invasion will lead to the “‘abomination of desolation’ spoken of by Daniel the prophet, standing in the holy place,” which will most likely be on the Temple Mount (Matthew 24:15). As Jesus clearly pointed out to His disciples, Jerusalem and the Temple Mount will continue to be the epicenter of global conflict until His second coming. After thousands of years of global conflict, peace will come to Jerusalem and the Temple Mount when Jesus sets His feet on the Mount of Olives and becomes “King over all the earth” (Zechariah 14:4, 9). One of the beginning works of that time of peace will be to build a new Temple complex including a new temple more beautiful than any of the past (Ezekiel 43:1-7). The annual Feast of Tabernacles, which was kept by Jesus during His ministry (John 7:37-39), will be centered at the Temple Mount where Jesus will dwell on this earth (Zechariah 14:16-19). The world will learn the beauty of participating in this wonderful feast, which pictures the 1,000-year rule of Jesus Christ and His saints on this earth (Revelation 20:4), and worshipping the Prince of Peace, the King of Kings. If you would like to know more about this festival and its meaning, please go to the Life, Hope & Truth Learning Center and download our booklet From Holidays to Holy Days: God’s Plan for You.